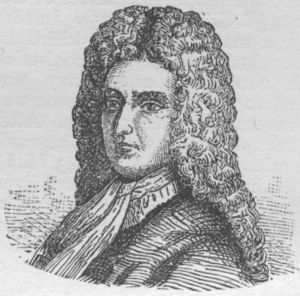 Daniel Defoe (1660 [?] – April 24-26, 1731) was an English journalist, novelist and spy, who is considered one of the earliest practitioners of the novel. Although there is some debate over whether Defoe can be rightly called the first novelist in England, he is almost certainly the first novelist to widely popularize the form. A prolific and versatile writer, he wrote over five hundred volumes worth of journalism, essays, fiction, poetry, and correspondence. Famous for his wicked sense of irony (Defoe's penchant for satire got him trouble with the law on several occasions), Defoe remains popular and readable today when many other authors of his time have faded away. Defoe wrote his fiction primarily to pay the bills, and the hurried quality of his writing is certainly visible even in some of his more accomplished novels. Nevertheless, Defoe is of great importance to literary history, not only for the exemplary mastery of his prose, but also for his critical insight into the politics and society of seventeenth- and eighteenth-century England. Few writers were as closely integrated into the English political system as Defoe, who as a secret agent risked his life for the crown on numerous occasions. Defoe offers us some of the most luminous commentary on the state of English politics and mores, and he does so in prose that is some of the liveliest of his times. Defoe has never fallen out of popularity among readers of English literature. Defoe was born Daniel Foe, probably in the parish of St. Giles Cripplegate, London. Both the date and the place of his birth are uncertain. His father, James Foe, though a member of the Butchers' Company, was a tallow chandler. Daniel later added the aristocratic sounding "De" to his name and on occasion claimed descent from the family of De Beau Faux. His parents were Presbyterian dissenters, and he was educated in a Dissenting Academy at Stoke Newington run by Charles Morton. Morton would go on to become the vice president of Harvard University, and he undoubtedly influenced the young Defoe with his commanding public oratory and his preference for the prose of John Bunyan. After leaving school Defoe decided not to become a minister, entering instead the world of business as a general merchant, dealing at different times in hosiery, general woolen goods, and wine. Though his ambitions were great and he bought both a country estate and a ship, he was rarely free from debt. In 1684 Defoe married a woman by the name of Mary Tuffley. Their marriage was most likely a rough one with his recurring debts. They had eight children, six of whom survived. In 1685 he joined the ill-fated Monmouth Rebellion, after which he was forced to spend three years in exile. In 1692 Defoe was arrested for payments of £700 (and his cats were seized), though his total debts may have amounted to £17,000. His laments were loud, and he always defended unfortunate debtors, but there is evidence that his financial dealings were not always honest. Following his release, he probably traveled in Europe and Scotland. By 1695 he was back in England, using the name "Defoe" and serving as "commissioner of the glass duty," responsible for collecting the tax on bottles. In 1701 Defoe wrote one of his most successful early pieces, The True-Born Englishman, a witty defense of King William of Orange, who had been criticized during his reign for his foreign-birth. The True-Born Englishman, still highly readable today, is considered one of the finest examples of Defoe's wry wit, as well as an eloquent critique of ethnic prejudice. In 1703 Defoe published an ironic attack on the High Tories in form of a pamphlet entitled "The Shortest Way with Dissenters," in which he (comedically) argues for the extermination of all those who dissent from the Church of England. In the uproar that followed, Defoe was prosecuted for seditious libel, sentenced to be pilloried, fined £200 and detained at the queen's pleasure. In despair, Defoe wrote to William Paterson, founder of the Bank of England, who was in the confidence of Robert Harley, 1st Earl of Oxford and Mortimer, leading minister and spymaster of the English Government. Harley brokered his release in exchange for Defoe's cooperation as an intelligence agent. Within a week of his release from prison, Defoe witnessed the Great Storm of 1703, which raged November 26-27, the only true hurricane ever to have made it over the Atlantic Ocean to the British Isles at full strength. It caused severe damage to London and Bristol, uprooted millions of trees, and over eight thousand people lost their lives, mostly at sea. The event became the subject of Defoe's first book, The Storm (1704). In the same year he set up his periodical The Review, written almost entirely by himself. The Review ran without interruption and was published thrice weekly until 1713, and was one of the most active periodicals of its time. Although Defoe originally began the periodical to assist Harley by publishing political propaganda, within a short time the Review encompassed articles on fashion, religion, society and the arts. Defoe's writings for the Review helped to set the standard for literary publications in eighteenth-century England, and, decades later, when Joseph Addison and Richard Steele would establish the Tatler and Spectator, they would draw much of their inspiration directly from Defoe. By September 1706 Harley ordered Defoe to Edinburgh as a secret agent, to do everything possible to help secure acquiescence to the Union Act. He was very conscious of the risk to himself. The political climate in Scotland was such that had Defoe been found out he could have very well been killed; nonetheless, even as a secret agent, Defoe continued to write and publish prolifically. In particular, a sequence of letters written to Harley and others during his tenure as a spy have become popular reading among scholars and general readers alike. Decades later, in 1726, Defoe would draw on many of his experiences as a well-traveled secret agent in his Tour Through The Whole Island of Great Britain. For the next ten years Defoe continued to devote most of his time to writing for the Review and conducting missions on behalf of the government's secret service. In 1715 he published his lengthiest non-fiction work, the heavily didactic The Family Instructor, which, while somewhat popular in its day, strikes modern readers as far too instructional. It would not be until 1719, when Defoe turned to writing fiction, that his fortunes would dramatically change. With the 1719 publication of Robinson Crusoe, Defoe was catapulted to the top of literary society. His novel, which has been a best seller for hundreds of years, was radically original in its time. Drawing on his years of training as a journalist, Defoe wrote Crusoe in a plain, unadorned, immediately accessible style peppered with his characteristic irony and wit. The novel was still a relative new literary genre at the time of Crusoe's publication, and Robinson Crusoe is often credited with bringing the novelistic form into the mainstream of English literature. Defoe based the story of Crusoe almost certainly on the autobiography of Alexander Selkirk, a Scottish seaman who had been marooned on a desert island for a number of years. While Defoe almost unquestionably utilized Selkirk as the basis for his story, he transformed the simple outline of the plot into a medium for high art and extraordinary humor. Crusoe's adventures on his desert island are drawn from equal parts reliable history and pure fantasy, and it is in the fantastical elements that Defoe's novel rises to its highest peak: by isolating poor Crusoe on his desert island, Defoe is able to delve deep into the mind of his character, producing scenes of lasting power and insight. Following on the heels of his international success with Crusoe, Defoe set off on a flurry of more fiction writing. In 1722 alone he published three novels, including two which have become world classics: Moll Flanders, the story of a young woman's descent into moral depravity and her eventual redemption in America; and A Journal of the Plague Year, a fictionalized account (writing in chillingly realistic prose) of the year 1665, when the Great Plague swept through London. In 1724 Defoe ended his lengthy experiment in fiction by publishing Roxana, his final novel. Although his health was in decline he continued to write prolifically as a journalist, essayist, and general muckraker until his death on April 24 or 25, 1731. He is buried in Bunhill Fields, London. Robinson Crusoe, universally considered Defoe's masterpiece, is also sometimes regarded as the first novel in English. The book is a fictional autobiography of the eponymous hero, an English castaway who spends 28 years on a remote island, encountering savages, captives, and mutineers before being rescued. The full title of the novel is: The Life and Strange Surprising Adventures of Robinson Crusoe of York, Mariner: who lived Eight and Twenty Years, all alone in an uninhabited Island on the coast of America, near the Mouth of the Great River of Oroonoque; Having been cast on Shore by Shipwreck, wherein all the Men perished but himself. With An Account how he was at last as strangely deliver'd by Pirates. Written by Himself. Crusoe leaves England on a sea voyage in September 1651 against the wishes of his parents. The ship is taken over by Barbary pirates, and Crusoe becomes the slave of a Moor. He manages to escape with a boat and is befriended by the captain of a Portuguese ship off the western coast of Africa. The ship is en route to Brazil. There, with the help of the captain, Crusoe becomes owner of a plantation. He joins an expedition to bring slaves from Africa, but he is shipwrecked in a storm about forty miles out to sea on an island near the mouth of the Orinoco River. His companions all die; he manages to fetch arms, tools and other supplies from the ship before it breaks apart and sinks. He proceeds to build a fenced-in habitation and cave. He reads the Bible and slowly becomes religious, thanking God for his fate in which nothing is missing but society. He discovers native cannibals occasionally visit the island to perform human sacrifice. At first he plans to kill the savages for their abomination, but then he realizes that he has no right to do so as the cannibals have not attacked him and do not knowingly commit a crime. He dreams of acquiring a friend and servant by freeing one of the savages, and indeed, when one manages to escape, Crusoe helps him, naming his new companion "Friday" after the day of the week he appeared, teaching him English and converting him to Christianity. After another party of natives arrives to partake in a grisly feast, Crusoe and Friday manage to kill most of the natives and save two of the prisoners. One is Friday's father and the other is a Spaniard, who informs Crusoe that there are other Spaniards shipwrecked on the mainland. A plan is devised for the Spaniard to return with Friday's father to the mainland and bring back the others, build a ship, and sail to a Spanish port. Before the Spaniards return, an English ship appears; mutineers have taken control of the ship and intend to maroon their former captain on the island. The captain and Crusoe manage to retake the ship. They leave for England, leaving behind three of the mutineers to fend for themselves and inform the Spaniards what had occurred. From Portugal, he travels overland to England; during winter in the Pyrenees, he and his companions have to fend off an attack by vicious wolves. Back in England, he decides to sell his plantation, as returning to Brazil would entail converting to Catholicism. Later in life, after marrying, having three children and becoming widowed, he returns to his island for a last time. The book ends with a hint about a sequel that would detail his return to the island. The book was first published on April 25, 1719. The positive reception was immediate and universal. Before the end of the year, the first volume had run through four editions. Within years, it had reached an audience as wide as any book ever written in English. By the end of the nineteenth century, no book in the history of Western literature had spawned more editions, spin-offs, and translations (even into languages such as Inuit, Coptic, and Maltese) than Robinson Crusoe, with more than seven hundred such alternative versions. ↑ Watt, Ian. "Robinson Crusoe as a Myth." Essays in Criticism (April 1951). Reprinted in the Norton Critical Edition (second edition, 1994) of Robinson Crusoe. Defoe, Daniel. A tour thro' the Whole Island of Great Britain. 1724-1727. This page was last modified on 5 August 2013, at 14:40.